Virabhadrasana or the Warrior Pose lives up to its name. Translating into the Warrior pose, in Sanskrit, ‘Veer’ stands for Warrior, ‘Bhadra’ stands for Good, and ‘Asana’ stands for Pose. In Hindu mythology, Lord Shiva is the epitome of all divinity and Virabhadra is also a name of one of the many incarnations of Lord Shiva, where Virabhadra was a fierce warrior with 1000s heads, eyes, and feet, and wore tiger skin. As mentioned earlier, this pose does justice to its name because it invigorates the whole body and creates a sense of awareness and alertness. Yoga Virabhadrasana comes in three series, with Warrior I, Warrior II, and Warrior III. In this article, we will discuss the benefits of Virabhadrasana 3, its step-by-step procedure, modification, and contraindications. Step 1: Come into the Mountain Pose or Tadasana and gather your breath. Prepare yourself mentally for Virabhadrasana III. Step the right foot ahead of you at a foot’s length and bring all your weight on the right foot. Step 2: Raise both the arms up in the air with fingers wide open and reaching out to the ceiling. Beginners can also interlace their fingers and point index fingers of both the arms outwards. Step 3: With an exhalation, lift the left leg up in the air by hinging at the hips. The torso and the arms will automatically come down and become parallel to the floor, while the back leg will be in line with the torso and form a straight line. In a ‘T’ form, where the arms, torso, and the back leg are the upper end of the ‘T’, the leg on the floor forms the body of the ‘T’. The knee of the leg on the floor can be slightly bent because locking the knee is not recommended. Step 4: The gaze will be down on the floor, fixated on a point to create balance in the body, as this is also a balancing asana. Stay in the pose for 3 to 5 breaths. Step 5: To step out of the pose, bring the arms and torso back to the starting position while the back leg will get back to the floor. Bring the arms down and rest in Mountain Pose for a few breaths and perform Virabhadrasana Pose on the other side. Virabhadrasana Iyengar Yoga form suggests performing the pose with a strict alignment in mind. Without proper alignment, it is impossible to reap the deeper benefits of the pose. It is suggested that beginner level practitioners perform this pose without raising this hands upwards. They can simply perform Step 3 after Step 1. When they will not use their hands, the body will first learn to balance on just one leg with torso parallel to the floor. The hands can be resting out on the sides or be placed on the hips. The arms could be placed over the head while the hands will hold the opposite elbows. Beginners can also use a chair to gain extra support in the pose. They can simply place the chair in front of them and as they go down in the pose which is step 4, they can hold the top of the chair with both their hands. This will allow them to gain support and confidence. Gradually, they can start shifting the chair away. The gradual pushing away motion will allow the practitioner to gain extra length and stretching in their torso too. Practitioners looking for a Vinyasa or a flow motion can simply flow into this pose from Virabhadrasana I and from there on, step into Virabhadrasana II, thereby performing all three poses in the Warrior Pose Series. 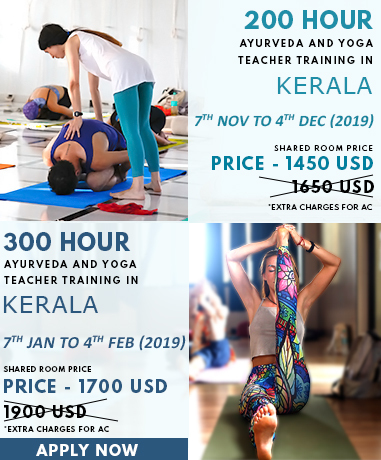 To know about Virabhadrasana III in further detail, explore our Yoga Teacher Training In India.